A good statesman needs to have the qualities of compassion, a strong sense justice, leadership abilities, and integrity, and of course good administrative ability and vision. 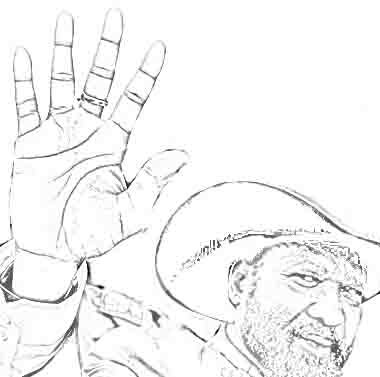 Do Salva Kiir Mayardit's (President of South Sudan) hands show these qualities? 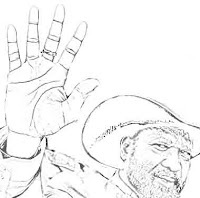 The significant features of Kiir's hands are the longish shape of the hand, deeply etched lines, a few conic fingers or normal length, a very wide mount of Venus, a high-set and sloping Headline, large supple thumb and a comparatively clean hand, with not too many lines crisscrossing each other. Either that, or the finer lines are not visible on the hand. a leader. His thumb, Mount of Venus and Heartline speaks volumes for his compassion, sympathy, willingness to help others, and his generosity. He is a warm, loving human being with strong sympathy for the underdog. He is also fairly simple at heart, and with strong ideals, which he will not compromise for anything. His strong principles and the compassionate nature are the strongest aspects of his hand. Check out his hand photo here and here. His capacity for leadership is further confirmed by his thumb and Headline. He is the type who is able to get along well with people and handle them with ease, or rather, control them with ease. He is able to get his way without seeming to. His quality of self-confidence and self-reliance helps him greatly in leading others. He is a very independent and original thinker, and thus will always be a leader, not a follower (thumb, Jupiter finger and mount and Headline). His highly individualistic and unique nature is enhanced by the fairly wide gap between his Headline and Lifeline. This shows a boldness and fearlessness in taking decisions, and not being hampered by others think. Often, this sign shows impulsiveness and unwillingness to heed advise. While Kiir does tend to be impulsive (Thumb and Headline), he is able to listen to others. His large thumb held a little away from the hand, its developed second phalange, as well as his sloping Headline, shows his openness to others’ ideas plus a strong desire to help others. He values independence and freedom (of speech, action, life) not just for himself - he values it as a principle. Make no mistake, where his principles are concerned he does not compromise. This can be a weakness as at times he sees things in a narrow perspective and can, in fact, be quite unreasonable! Also, at times he can see the details of an issue all too clearly, but miss the bigger picture, but yes he has vision. Materialism is shown on his hand, but this reduces significantly as he grows older. He does not score very highly on administrative ability and can be impressionable and impulsive. This is a weakness but it can be offset if he chooses the right people to govern for him. He has to be very wary of whom to trust as there are signs that he can trust the wrong people. To sum up one can say that he certainly is a visionary, that too of a unique kind and an original and clever thinker. Note: Salva Kiir Mayardit is the President of South Sudan, a new country born in July 2011 after Sudan was divided into half into North and South. Hand Readings of other African leaders: Nelson Mandela's hand reading or Muammar Gaddafi Hand Reading or Idi Amin's hand reveals his lack of reasoning powers or Jacob Zuma's hand analysis or read about the Heads of State of different countries around the world. /* Despite his determination and ability to control others, he is not adamant or stubborn */ - Very difficult combination to achieve! These kind of people are generally firm and stubborn. Looks like South Sudan is relatively luckier, for a new nation. I had not heard of Kiir before. Certainly an increase in my general knowledge! I guess that is really very great leadership ability which is rarely found! I think a lack of a big ego enables him to be back down when necessary. Anonymous, there have been others who have asked me. But this will take away from the book I am writing. My knowledge is self-learned, and the way I reach conclusions are through my own experience. If I write it here, before you know it, someone will have copied it and published it in their own book! The internet is the most dangerous place to publish your own research! When it comes to basic level information there are a lot of palmistry books which give it. Good to read that your knowledge is self-learned Nita, thats very difficult to achieve, but once achieved self-learning makes people exceptional. I remember going through palmistry books when I was young, but there were too many technical terms involved for me to properly grasp what was written! I hope your book will be simple to understand. Thanks DI. And yes my book will be simple to understand and it will make it easy for anyone to read their own hands. I have developed templates and glossaries. For example if a person has say charisma, there will be five signs on the hand to look for. Each sign is different and so is its significance. So the signs will be given in the order of their importance and it will also be told how many signs the person needs to have to have that particular characteristic. This will help the reader make the right judgement. The judgment required to weigh different signs takes years to master. Base how you look at Salva kiir hands, do you see him as capable, determine and visionary leader? And if he has weakness, which is it? Anonymous, I am not sure of your question. I have already said he has leadership qualities and already mentioned his weaknesses.